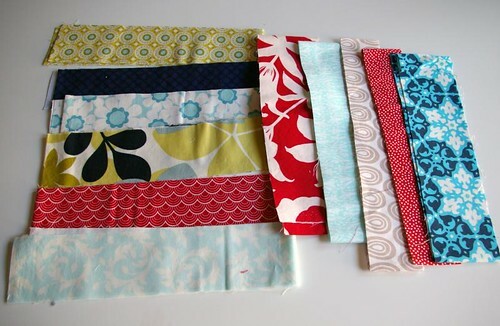 You receive in the mail this gorgeous set of fabrics for the 12 Squared virtual quilting bee from Sarah, have a great idea and want to start sewing. You have all these cool box bags (my favorite batch so far) that need to be worked on. 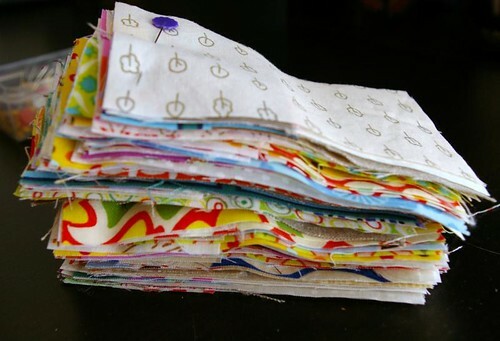 You have this small scrappy quilt top (Strips and Bricks by Malka Dubrawsky aka Stitch and Dye in Sew Hip, April 09) all cut up and ready to sew. 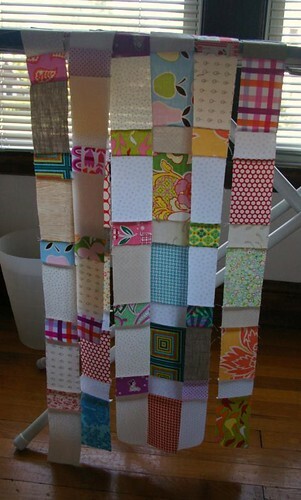 You start working on this quilt and almost at the end of the 7th strip out of 15, your sewing machine goes on the fritz. Yes, the machine is kaput, unusable, done for, dead to me. At least until I can get it looked at, which, because it’s the summer and a holiday weekend, not going to be until Monday. To add insult to injury, my friend graciously offered to lend me her barely used sewing machine, and I can’t get it to work, something wrong with the feed dogs. It really isn’t fair, isn’t it? I think I’m not going to get any sewing done this weekend. I guess I’ll have to knit! Wish me luck on Monday that they can fix my sewing machine really quick! Aw – sorry. It will get better! Woe! It does seem as the universe does not want you to sew this weekend. Hopefully you’ve found other things to keep you occupied! 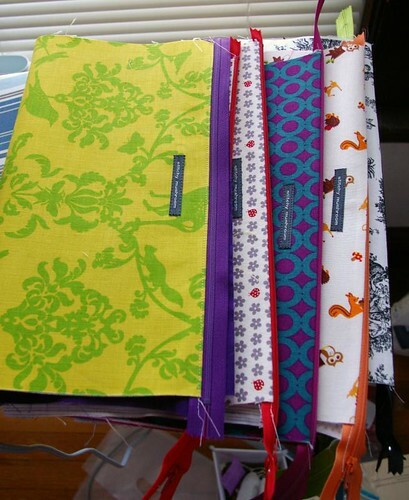 and I haven’t forgotten about the aprons…things have been crazy around here the past few weeks. What a shame! I was away all weekend and you could have used mine. Hope it’s a quick fix.